What is the Mahahual Malecon? I am frequently asked, “What is the Mahahual malecon?” The simple answer is that it in Mexico, a waterfront pedestrian walk along any urban waterway, be it ocean, lake or river, is a “malecon”. They are found all over Mexico. The downtown Mahahual malecon, although it is still in its infancy, it is already one of Mexico’s most spectacular. Easy to be when you have some of Mexico’s nicest and most pristine beaches, clear blue Caribbean ocean, and a reef that runs the length of the entire downtown, protecting the beaches from any wave action and making the entire city beach like a giant swimming pool with palm trees. Simply put, it is one of the best pieces of beach in the world, so why not put a malecon next to it! The Mahahual malecon is just a bit over a mile and a half and extends from the town’s signature lighthouse on the north, to just past the city pier on the south. Within that area is the downtown city beach area, where visitors can find great deals on shopping from real local merchants, along with really fun beachfront restaurants, bars and beach breaks. Mixed in along the way are dozens of local walk up services for almost any activity you might want to do. No reservations, deposits or giving your credit card info over the internet to who knows who. Just walk up and take your pick from the many cheap and fun tour operators for fishing, snorkel, banana boat, equipment rental companies, beach massage, you name it, and then get ready for a fun day. Most find a beach break or restaurant, set up a day camp in their loungers or tables, and play, drink and eat from there all day. Environmental impact regulations keep the seating under control in town, so even the busiest places are never that crowded. Day guests can get massage, others can shop, snorkel, jet-ski or whatever, while others can just nap in a lounger next the ocean. 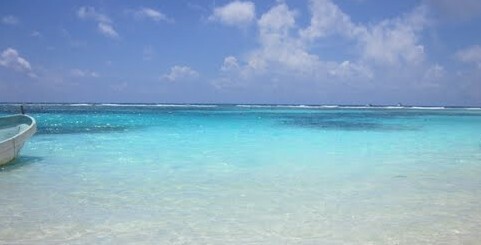 If it is in your vacation plans, you can most likely find it along the Mahahual malecon. For those who like to shop, the malecon is home to what is more like “real Mexico”, with family owned shops and small stands all along the downtown. Real Mexican products, at real Mexican prices. Lots of junk and fake stuff, like designer sunglasses, purses, costume jewelry and “Cuban” cigars. But there is also a lot of great stuff to be found as well. Wonderful local handmade items, from hammocks to clay pottery, are just a few of the sort of gems one can discover wandering in and out of the many stands and shops. Be ready to bargain, it is the way it is done in Mahahual. Have fun with it, the locals do! The malecon is a fun place for cruise ship guests to enjoy a few hours each day while the ships are in port. The taxi trip from the port to the malecon is just $2 US per person and the drive is just 3-4 minutes, which allows visitors to spend more time enjoying our beaches and less time in lines and taking long transports. However, the malecon is also home to some very nice little boutique hotels offering tourist quality accommodations at all price levels. From thatch cabanas to 4 star hotels, the malecon has a great room for almost any taste or budget. We don’t really care how you come to Mahahual and enjoy our Malecon, in a cruise ship or from a hotel. We just want you to come and see our beautiful and friendly little town by the Caribbean. We love to show it off! 2 Responses to What is the Mahahual Malecon? It is great. Happy New Year Steve.